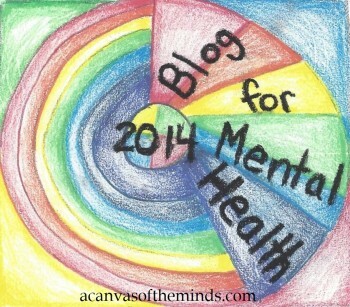 My depression was not understood by many people including several family members. My sisters were young at the time and they just knew that their sister was getting a lot of attention. This is one thing that I feel badly about even today. I remember not wanting to eat during these times. I had no appetite and felt like I was fat so took advantage of this. One time, I remember my mom forcing me to eat a cheese sandwich. I know she was watching out for me. However, this sticks out in my mind because I remember forgetting to eat it. She had to keep reminding me. It was not because I didn’t want it, but because I could not concentrate. I kept forgetting what the task at hand was. Because my parents were very concerned about my depression, they brought me to two different doctors. The first kind one my mom had found out about via a friend. This doctor was an environmental allergist. (Back then, these kinds of doctors were considered whacks. )The allergist would talk about how it was my food and things in the environment causing my depression. The doctor ran tests to find out I was allergic to many things and therefore I started getting shots. In addition, I was supposed to eat a very strict diet and we were supposed to remove things from my environment that would be causing me to get sick. If I had to do it all over again, I would have stuck with this doctor and probably would not have had the problems that I have today. Note: I could still do it, but for whatever reason, just don’t. I did try taking out wheat from my diet and I think it helped with my depression somewhat. However, after about eight months, I just didn’t think it was worth it. The other doctor I saw was a psychiatrist. While in his office I would just stare at the plants behind him and not say anything. We just sat there in silence. There was nothing to talk about. I was depressed or had been depressed, but in both cases there was not a reason. Thus, there was nothing to talk about. He did, however, get me into a group with other teenagers that he had started running. From that group, I realized I was not alone. The others mostly had reasons why they were depressed and things to talk about, but I don’t remember sharing very much. I did, however, meet someone who I ended up having a great friendship with. His name was Brian and becomes a major player in my next blog entry. 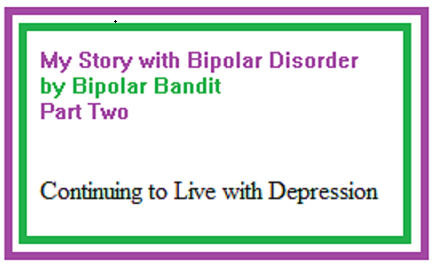 This entry was posted in Uncategorized and tagged alternative medication, bipolar, bipolar disorder, depressed, depression, living with depression, manic, psychiatrist, story about depression. Bookmark the permalink.